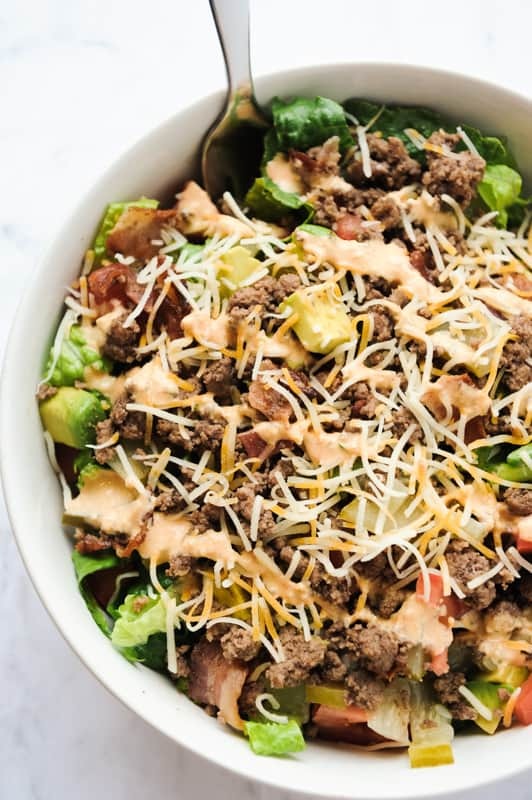 My favorite keto salad recipes are any variation of a burger in a bowl! I found myself seriously bored with the usual healthy lunches awhile back. Salads can become super boring if you are eating the same thing over and over again! I had some turkey burgers in my freezer and the remainder of what constitutes a darn good burger, so I threw it all in a bowl for one tasty low carb salad. 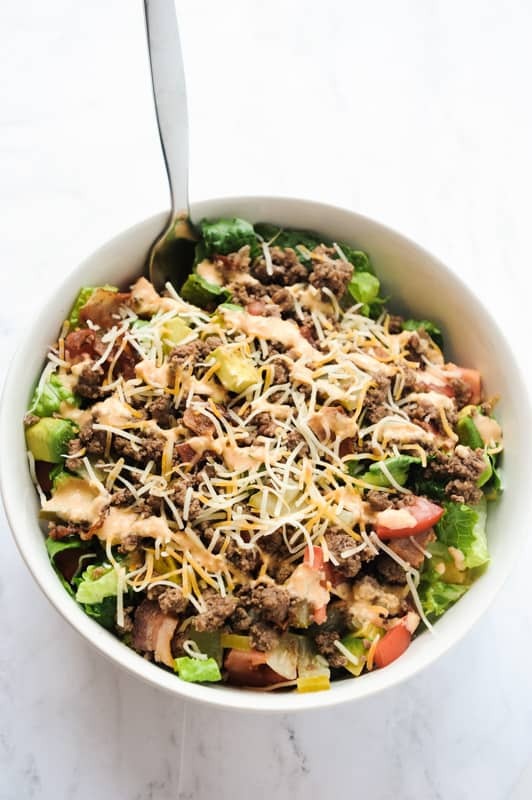 I completely forgot about the burger in a bowl until a few weeks ago when I was scrolling through Pinterest and saw a cheeseburger salad! Remembering my former creation and this new recipe I saw, I made the super yummy Bacon Cheeseburger Salad. This recipe is a great new twist on your usual keto hamburger recipes and makes your keto salad recipes just a tad more interesting. I could have sworn I was eating a big mac! And I did not miss the bun! 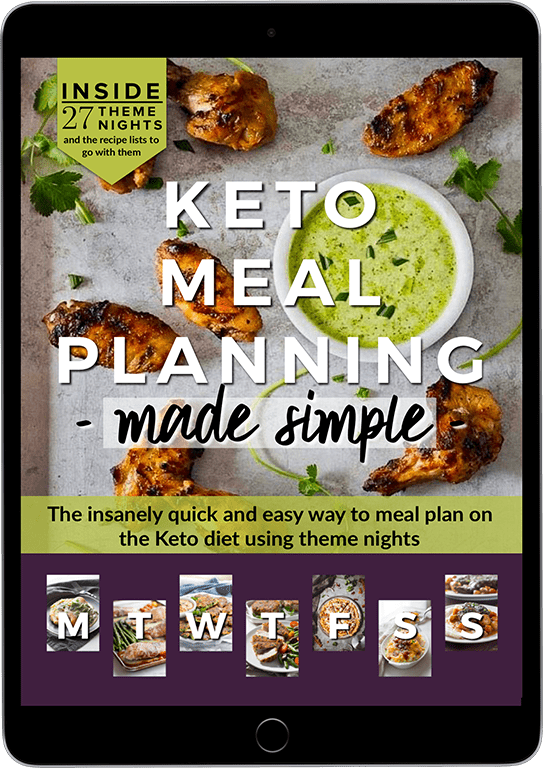 In a quick and dirty Keto tutorial, the Keto diet is basically where you eat higher amounts of fats and lower amounts of carbs. Once done properly, following a Keto diet will send your body into a state of ketosis, during which your stored fat is used as energy. So, your calories are coming from fat, not carbs. Thus, your body burns your stored fat! If the Keto diet is something you’re looking to follow, it can become quite pricey to purchase fresh, organic foods, right?! 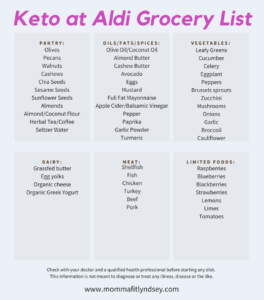 In an effort to help you stay on budget, this post is going to help you navigate the Keto diet at my favorite budget friendly keto store, Aldi! I am not lying when I say that once you start to ditch the carbs, you really don’t miss them! Every once in awhile I will get a craving for bread, but it’s few and far between. 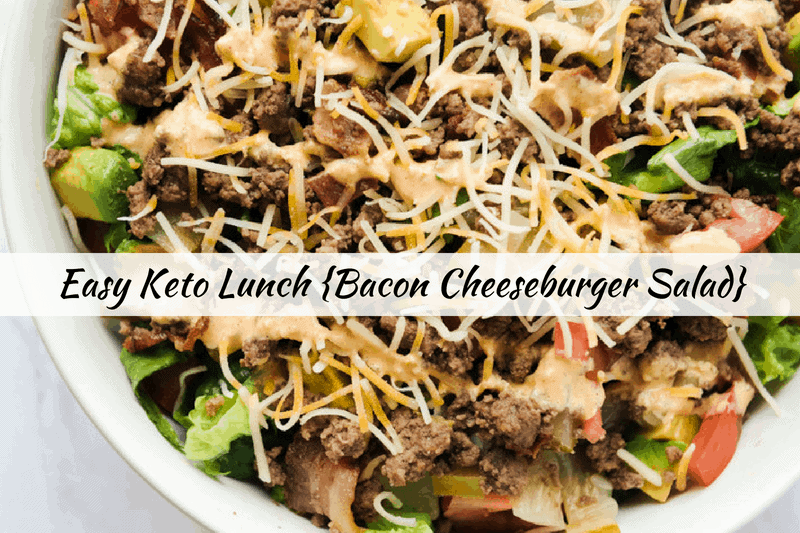 This keto burger salad is designed to give you all of the flavor of a yummy burger but a low carb burger! 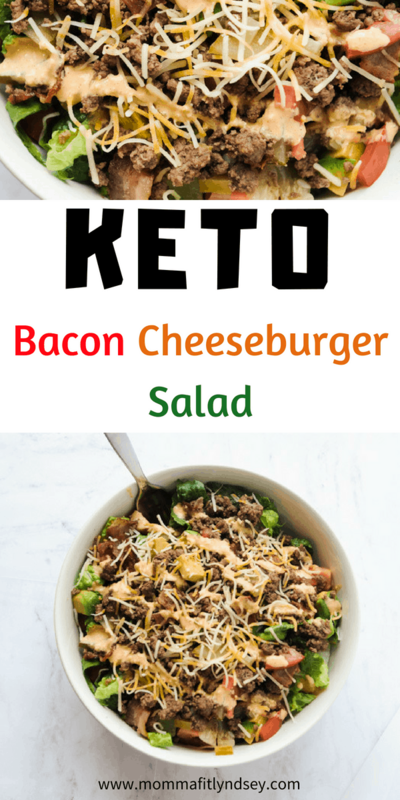 This keto bacon burger salad is super easy. I’m all about meals that can be used for dinner and lunch leftovers! The prep was incredibly easy. Aside from pan frying the hamburger meat and washing and chopping up the vegetables, this is one of the most simple keto recipes. Don’t you love it when meal prep takes next to no time at all?? This recipe makes about four servings. My husband loved it and who doesn’t love a healthy recipe that is husband-approved!? If you are missing the bread, try this low carb cloud bread recipe from low carb yum! Season beef with salt & pepper. Brown beef until cooked through in skillet. Set aside. Cooking bacon in skillet over medium heat until desired doneness. Chop into bite sized pieces once cooled. While beef and bacon are cooking, clean and chop veggies. Set aside. After veggies are chopped and cleaned, blend dressing ingredients in a blender until smooth. Set aside. Once all ingredients are completed, begin to layer salad. Use 1/4 of all total ingredients for one serving. Layer in this order - romaine, burger, bacon, cheese, avocado, tomatoes, pickles. Drizzle with 1 TB (or more depending on your liking) of the dressing.